[Anthony Pray] had his car stereo stolen. When thinking about replacing it he realized the he and his wife never used it for anything other than an Auxiliary connection to play songs from their cellphones. So instead of buying a head unit he pulled an unused home audio amplifier out of a dark corner of his house and wired it to the car speakers. Problem solved, except that the under-dash installation meant the only volume control is on the phone playing the audio. He decided to build a wireless audio controller that would let him send commands to the phone without quite as much distraction from the road. The device you see above is his creation. What a beauty. But seriously, it’s so random and hacked together how can you not love it? And, it works! 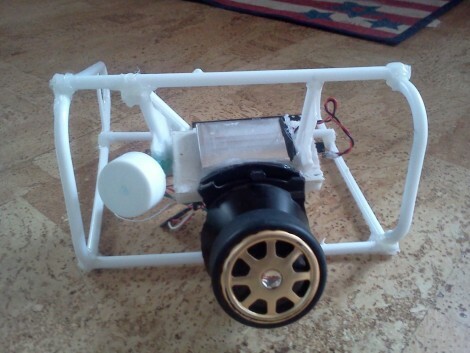 The frame is made from plastic coat hangers, and the wheel is an old RC control knob. There’s even a play/pause feature built from the clicking properties of a retractable ball-point pen. A Cypress PSoC board reads the knob and pen positions, then pushes commands via a Bluetooth module in order to control the phone. He recorded a testing video (after the break) which gives you a better look at the functionality of this setup. where does this controller get mounted? In related news, creative labs computer speakers run on 13.5V. Just lop off the 120V xfmr and hook up the 12V car plug. Sure buckling in a redundant set of speakers complete with subwoofer might seem hackish but .. well look where we’re at on this one. It’s simple and sounds great. Eh, it works so I suppose thats good. Although its way over complicated and un-needed. Unsoldered the pot and remounted on the dash… that is what us analog guys would do. Mounting it in the unused ash tray (at least for me) would also give you a pull out (but otherwise hidden) control. Wanted to have play back controls, was all was bugging be driving solo. This goes in the gaping hole in my dash. Actually, this is a terrible idea. Not sure about your 120v inverter, but mine’s ground/neutral pins are 60v from battery negative (DC iirc). I found this out by decoupling my laptop’s ground pin (ground loop could be heard when laptop was connected to 12v amplifier). I should have checked to see if the chassis ground/neutral wires were tied to the 12v system’s ground. They weren’t. Long story short, my laptop now outputs 2ch audio only. The lesson, don’t connect devices running from a 12v system to devices running from an inverter unless you know what you’re doing. I mentioned how mixing car voltage system (12v) and 120v inverted power is potentially dangerous in an earlier comment. Unfortunately, a moderator decided it was inappropriate? Look, if you plug your phone into the cigarette adapter of your car and then plug the sound jack into your 120v stereo you are risking destroying your phone or your amplifier. I know this from first hand experience. My 1000 watt inverter’s neutral/ground lines sit at -60v DC with respect to battery negative terminal (the chassis of your car). If you connect a 1/8″ stereo jack while your mp3 player is charging you may find out the hard way that it’s best not to mix systems with different ground potentials. let me clear this up it was a car audio amp 12v I had laying around, not a 120v. but thanks guy for the concern. whaaa… people still steal car stereos? The only car theft I have seen is when stupid people leave their GPS or laptop just sitting there.